A Small Chest In Pine. If you’re new to purchasing wood furniture, deciding what to buy can be a daunting challenge. There are so many types of woods and so many different stains and topcoat finishes that it may not be even clear what type of wood you’re buying. Pine is a very common wood used to make furniture, including dining room tables and bedroom sets. Pine can be used for solid furniture pieces that are finished as is, or it can form the carcass of a furniture piece that is then covered with a wood veneer—sometimes a veneer of much more expensive wood. Pine is one of the common softwoods of the Pinus plant genus. Solid woods are classified as either hardwoods or softwoods, a distinction that is actually based on the tree’s biology rather than the strength of the wood. Hardwood trees lose their leaves seasonally, while softwood trees maintain their leaves year-round. Pine is a common softwood that’s grown and used worldwide in every for every imaginable purpose—from structural framing lumber to furniture, from wood trim to plywood. There are several dozen different species of pine distributed widely, but the species most often used in furniture are a handful of species known as white pine and yellow pine. Pine is light in color with a prominent grain and has knots that are usually much darker than the rest of the wood. Many woodworkers, especially amateurs, favor pine because it is easier to work with than hardwoods. 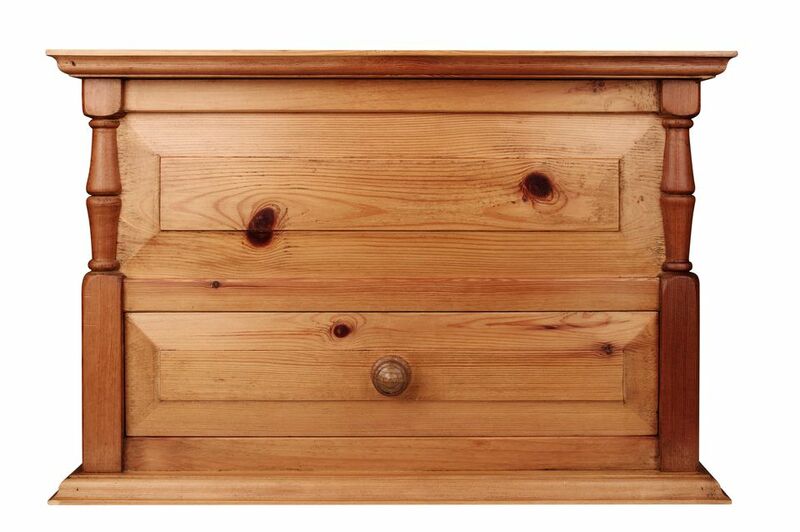 Pine has many virtues as a furniture wood. It is less expensive than many other wood pieces, especially if you buy it unfinished. It can be painted, stained, or covered with a clear coat of varnish. The wood’s noticeable grain and knots give each piece a unique look. In home decor, pine furniture blends well with other woods, allowing the buyer to mix and match pieces. Pine furniture adds coziness to a room, and the wood is ideal for rustic or English Country decor. Pine’s light coloring keeps bookshelves, armoires, dressers, and beds from appearing heavy and stuffy. Unfinished pine furniture allows great flexibility in a child’s room, since it can be personalized by painting or stenciling, and can be refinished and repainted as the child's taste changes. The quality of pine furniture can vary widely. Although pine is softer and more pliable than most hardwoods, many pieces will still last for decades if they are well constructed. Knots should be expected and can be attractive in a piece of pine furniture, but watch out for knots that create holes—too many knots can weaken the piece. Although pine is a sturdy wood, it can easily be dented and scratched. Like all woods, pine will warp when exposed to constant humidity or moisture. Well-crafted pine furniture will be smooth, with vertical walls that are plumb and free of bowing. The fasteners on the drawers should fit snugly, creating a tight fit between the drawer fronts and the drawer boxes. Drawers should pull out smoothly and resist twisting. Factory-built pine furniture is usually fairly inexpensive, and even custom-built pine furniture can be surprisingly affordable. Local Amish and Mennonite communities may have woodworkers who can craft a custom piece for about the same cost or even less than retailers charge for mass-produced furniture. Reasonably priced pine furniture also is sold at many big-box retail stores. IKEA, for example, carries a full range of mass-produced, unfinished pine furniture pieces. This furniture does need assembly, but this requires only patience and is not overly difficult. Also, check yard sales and resale shops for used furniture pieces in good condition. They can easily be stripped and refinished to suit new tastes.